A musical journey to the land of Make Believe! Where can you go to see pirates, princesses, castles, dinosaurs, and more… all in one place? That’s easy—your imagination! 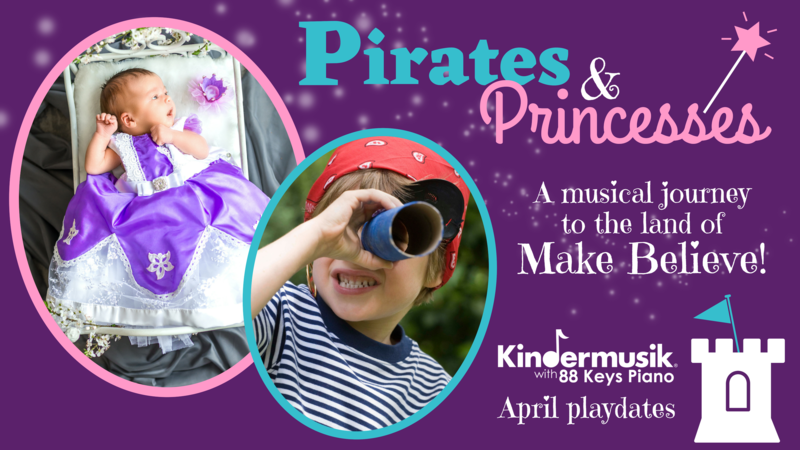 Join us for our April playdates as we make music, make magic, and make believe! All our little musicians will receive the royal treatment as celebrate our creativity and pretend play. In this enchanting class, we all get to be Pirates and Princesses! 10 digitally downloadable Kindermusik songs of YOUR choice! Our April playdates will be held three times, so feel free to enroll in one or more dates. Playdates are open to children ages 0-7 and their caregivers! Spaces in each playdate are limited and tend to fill fast, particularly the weekend dates, so hurry to enroll now and save your family’s spots! Ages newborn to 7 years; multiple adult caregivers welcome! Saturday, April 13, 2019 at 10am – STILL ROOM! Wednesday, April 24, 2019 at 10am – STILL ROOM! Saturday, April 27, 2019 at 10am – STILL ROOM! See you soon in class!